Development of the tar sands has already begun, with three large companies — Suncor, Syncrude, and Albian — producing large quantities of crude, and six more massive projects in the early stages. As the soaring price of oil makes these resources financially more viable, many other leases are being explored. An estimated US$100 billion is expected to be spent on tar sands development over the next 20 years. Though this may sound like a few lifetimes of oil, there are serious social and environmental issues related to the extraction of this bitumen: the provincial boom-and-bust cycle that is being created, including labour, infrastructure and materials shortages; the water intensivity and resulting pollution; and the significant volumes of natural gas it requires. These concerns raise the question of whether the current rate of expansion (planned growth from one million barrels a day to six million barrels a day, most of it destined for export) is reasonable or sustainable. In terms of the social costs, the dramatic expansion of the tar sands development has created labour shortages, exacerbated by infrastructure shortages in Fort McMurray, that increase the cost of living in the area. The boom is also causing materials and construction costs to shoot up across the province. The rapid pace of extraction has also led to inequities between the provinces, with Alberta in an embarrassment of riches, part of which is being thrown at local infrastructure spending, escalating the boom. In the absence of any plan, provincially or nationally, for pacing the development to maximize the jobs and returns to the province over the long term, there is instead a bonanza, using foreign workers and union-busters in the short term, while offering royalty holidays. The natural gas situation is even less sustainable. Conventional natural gas has already peaked and is on the decline. This is a key source of power generation for Alberta. As the tar sands consume the gas, the province is already returning to coal for power, and losing value-added jobs in the petrochemicals sector. As that clean source of fuel expires, the tar sands are turning to non-conventional gas sources, all of which have higher social and environmental costs: the Mackenzie Valley pipeline, coal-bed methane, and in-situ (extraction of the gas from the bitumen). There has not been adequate public debate on the impacts of coal-bed methane, in spite of the huge landscape impacts of the well-intensive drilling and pipelines needed, and the likely impact on water tables in an area already short on water. The in situ strategy is no better, as it has huge carbon dioxide emissions, while the tar sands operations are already among Canada’s largest industrial polluters. Most of the oil to be taken from the tar sands will go to the United States. In effect, the Athabasca deposits will be the centrepiece of a new continental energy grid. Its main purpose will be to provide a secure supply of fuel for the American industrial and military machines. Canadians are already paying a steep price for feeding the voracious American addiction to the dwindling world reserves of oil and gas. 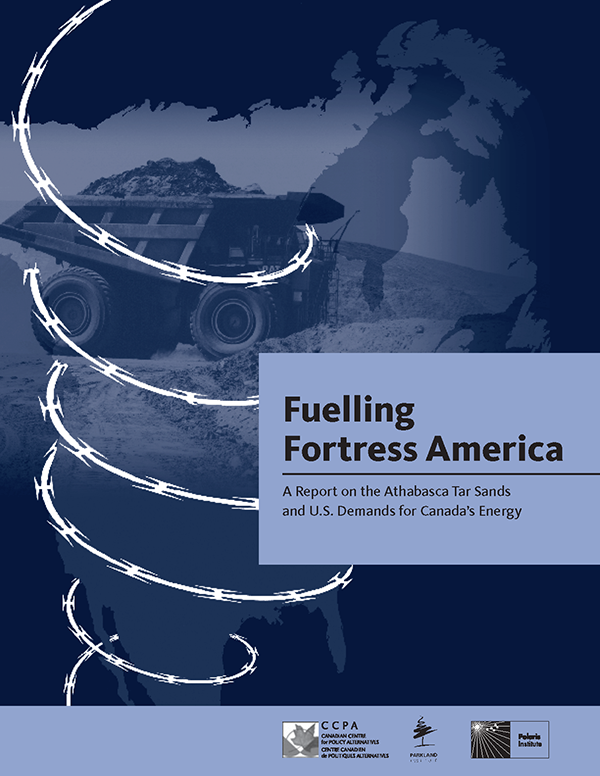 Given that the rapidly increasing exports of Canada’s oil and gas to the U.S. puts our own energy security as a nation in jeopardy; that Canada, despite being a petroleum-producing country, is already forced to import nearly half of the oil its people need; that Canada has less than a 10- year supply of conventional oil and natural gas remaining; that most of the tar sands oil is earmarked for export to the U.S., and most of the natural gas from the North is also intended for the U.S. market or to fuel extraction of the tar sands crude — the continuation of current energy policies is clearly not in the national interest. There may be ways of developing the tar sands that could contribute to Canada’s long-term energy needs, including the inevitable transition to renewable energy sources. But, shockingly, there is no coherent national or provincial energy policy to address this need. Nor is the federal or any provincial government conducting the research or public consultation needed to formulate policies for meeting the world energy crisis — or even for assuring an adequate ongoing supply of energy for Canadians. To be viable, any decisions or policies on energy we arrive at should be based on a complete understanding of all aspects of the tar sands development. It is a project that brings with it enormous economic, social, and ecological costs, as well as raising concerns about our role as suppliers of oil and gas — and soon electricity and even water — to feed the ravenous U.S. appetite for Canada’s resources. Transfer to the government of the Northwest Territories the constitutional powers to set its own fair rate of royalties on the extraction of natural gas in its jurisdiction. Initiate, with the provinces, a national strategy and timetable for reducing dependence on fossil fuels, conserving our remaining supplies of oil and natural gas, and massively increasing investment in renewable energy alternatives such as solar and wind power.